It's Wednesday evening, and we're back from our short PEI trip. 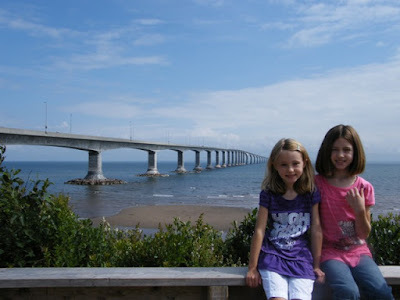 We picked up Jessica and Emily early Monday morning and drove to Cavendish. We had a short photo stop to take a picture of the bridge since the kids had not seen this great engineering marvel before. Then back into the van, crossed the 11km bridge and on to Green Gables Cottages. We met up with Michele and Wade and the triplets. Despite not seeing more than 30 minutes of sun for the time we were there, we had a great time with the kids. 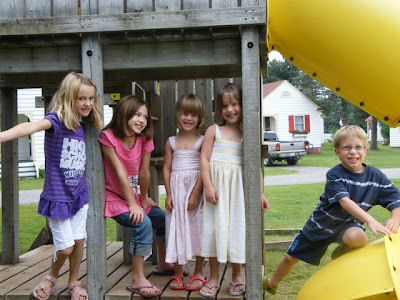 There was a nice little play area and a heated pool at the cottages. We spent a fun day at Sandspit in Cavindish and then we had another cloudy day so we went to the Haunted House. The kids were scared to death, but got into the spirit of things after the really scary part. 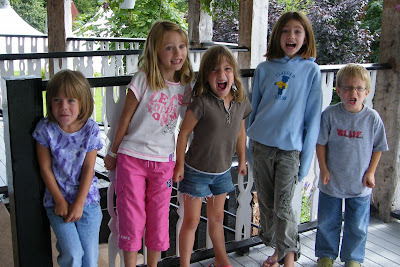 Here are the kids showing their scared faces. There were some really nice gardens in bloom at the end of the haunted house tour.